Although penguins can't fly, it has been said that they fly through the water because the movement of their wings is similar to the wing movements of birds flying in the air. ground to camouflaged burrows hidden in coastal hills. They wear black and white yet have camouflage from predators. They breed and socialize on land yet they lack the ability to fly to either escape a predator or move efficiently. They nest on land up to 2km from water despite having very short legs that limit their capacity to walk easily. Regardless, penguins of most species usually return each year to the same rookeries and even to the same nesting site within the rookery. Flying birds need a relatively large wingspan to hold them in the air, but small wings work best for birds swimming through the water. Their streamlined body, webbed feet and oar-like wings enable penguins to shoot through the water at speeds up to 15 miles (24 km) per hour. 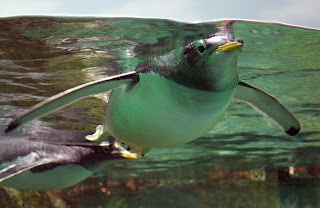 They allow penguins to glide on the water's surface or zip around underneath, where these birds seem completely at home. 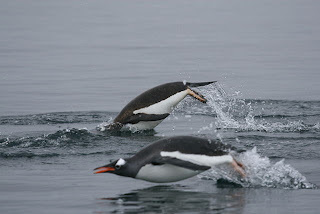 Their speed underwater plus the ability to hold their breath allow penguins to catch aquatic prey. This clip of penguins using their wings as flippers to propel themselves through the water sums up nicely why penguins are found across the southern oceans (Not in the Arctic!). Unlike most birds, which have round light bones that help them to fly, penguins have strong, solid bones that allow them to sit lower in the water and to dive for food. The bones in a penguin’s wing are both strong and flat, like a flipper of a sea lion or fur seal*. In the water, they use their legs only to steer, which is important both for catching prey and for navigating rocky shores as they leave the water. The penguin's small, thin wings and strong bones make sense when you consider that water is approximately 800 times denser than air! Picture moving a broad flat object like paper or a broad bird wing through water! Now picture folding that paper several times to make a small thin rectangle, which is much easier to move through water. This is the idea behind the design of the penguin's wings. Streamlined penguin bodies are shaped like a torpedo, wide in the middle and tapered at both ends, to slide through the water as efficiently as possible. Penguins further reduce resistance while underwater by swimming with their heads hunched into their shoulders and pressing their feet against their tails to aid in steering! 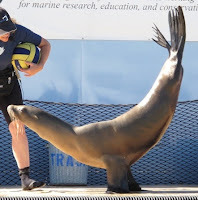 Marine mammals like sea lions and whales have evolved the same shape to maximize their ability to move and feed in the water. Note any resemblance here? This trick is called porpoising. 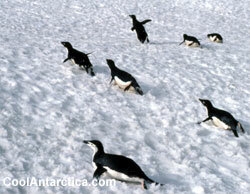 Penguins feed only in the water, usually within 15.3 to 18.3 m (50-60 ft.) of the surface. They eat mainly krill, squids, and fishes, so speeding through the water is essential to catch their prey. How does one thrive when eating such slippery food while underwater, especially without teeth? Penguins lack teeth. They swallow their food whole, catching the fish, squid or krill with their powerful hooked bills. Their tongues have a rough, Velcro-like texture that helps them hold and swallow their slippery food. Penguin feathers are small compared to those of other birds, but they have many more of them (up to 15 per square cm, 100 per square in. ), and they overlap to form a tight barrier that holds in heat and shuts out the cold water. Under their feathers, penguins have a layer of fat that keeps them warm as well as dry. The black feathers on their backs absorbs as much of the sun's warmth as possible when they are on land or ice. Penguin feet have several adaptations for cold-weather swimming and walking: they have webbing, claws, and when they walk on ice, their feet receive more blood to keep them warm so they turn pink! When they need more speed and efficiency on snow, penguins can tobaggan, using those strong, clawed feet to push themselves along on their bellies. Have a look at this video, in which adelie penguins combine walking and tobagganing in the snow and ice of Antarctica, taking advantage of the terrain. Clever! Penguins are famous for their black and white formal wear (note: tuxedos worn only by some species). It might seem that wearing black would be a bad idea for a slow-moving bird on the ice or rocks - you'd think this coloration would give them away to either their prey or their predators. Many Antarctic penguins have no land predators so the black coloration does not compromise their safety. In fact, the dark plumage on their backs not only helps keep penguins warmer by absorbing the energy from the sun, but it may also help them find food. When penguins are swimming, their white bellies look a lot like the light sky to predators (or prey) looking up from below, making penguins less visible to both. 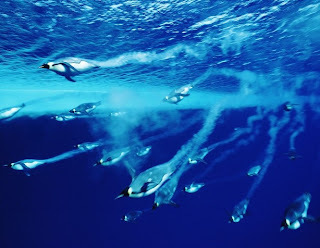 When small fish swim above a penguin, the bird's black back blends in with the dark depths of the sea, making it less visible to small fish swimming above. The combination must be good, as both male and female penguins use it! Penguins are sexually monomorphic, meaning males and females look similar. Think of a sexually dimorphic animal, and you might think of birds like peafowl or most ducks, or mammals like lions. *Yes, I know, there is outstanding footage of Emperor penguins walking tens, even hundreds, of kilometers across Antarctic snow and ice to have their chicks in the middle of nowhere. **Reminder note: fur seals and sea lions use their strong front flippers to zoom through the water and walk some on land, whereas true seals have wimpy little front flippers and move on land by flopping along on their bellies (they swim moving their rear flippers back and forth like a fish’s tail). 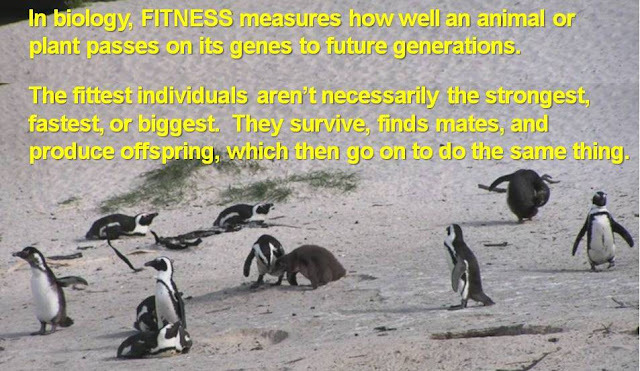 Can you brainstorm more features that would enhance the fitness (survival, breeding) of a penguin? How would you build the perfect cold-water animal? -- New England Aquarium's teacher guide on penguins has pages on penguin adaptations, conservation, and characteristics. -- The SeaWorld penguin infobook has pages about the diet, swimming, breathing, sleeping, communication, reproduction, and other behaviors of penguins. You're right, penguins are just so cute! Thanks for all the info about them, might have to read up before I next visit a zoo!